Congratulations! You followed our Facebook post and this leads you to our little Buyandship Easter special: This exclusive Easter-Shopping-Guide! None of the other members can see this shopping guide, this is exclusively for those, who followed our facebook treat post! For every new member, if you sign up now, you can get US$8 shipping credit for your first shipment! Fashion Item Discounts ► Ralph Lauren — 30% Off Sitewide Ralph Lauren is a classic, yet trendy brand and are currently offering 30% off Family & Friends Sale! Get the chance and shop your new spring warderobe now! Offer only lasts until April 21th. Don’t forget to change country to the US on the top left of the online shop, in order to shop the best discounts! ► Tory Burch — Up to 30% Off If you are looking for new handbags and accessories to emphasize your spring fashion style, then..
Presents for your partner are hard to find? 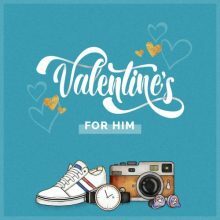 We help you with this Valentine’s Day Shopping Guide! Simply spend a few minutes and shop online, send the purchase to our closest oversea warehouse, and get your Valentine’s Gift in time for Valentine’s day! Surprise him and make him the happiest man! ► Jack Spade Items You’ve surely heard about Kate Spade, but did you know that they have a men’s line called Jack Spade? Of course, the design concept is similar: business bags and wallets with sleek details suitable for all types of men! Buy a nice bag for him now and maybe the wallet for his birthday? ;) ► Japanese Handmade Glasses Tai Ba Lang When it comes to Japanese hand-made glasses, the oldest name and the biggest brand is Tai Ba Lang. The main reason of fame is that NUMBER (N)INE has been worn by Tongmu Village. Tai Ba..